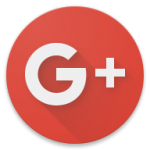 A new version of Google+ started rolling out yesterday, and now we've got all the details on what's new. There are a few subtle UI changes, some navigation improvements, and a big change to link handling that some users started to see in the last build. If you were feeling left out of the limited Chrome custom tab test from the last update, you can stop being bummed about that. Everyone should have this feature now, but that's not all. Here's the changelog courtesy of Googler Luke Wroblewski. The bottom bar added a few versions ago is rather divisive, but in this update it actually gains a new feature that makes it a bit more useful. You can scroll to the top of the section you're in by tapping on the corresponding button (it could previously only do this in the home stream). 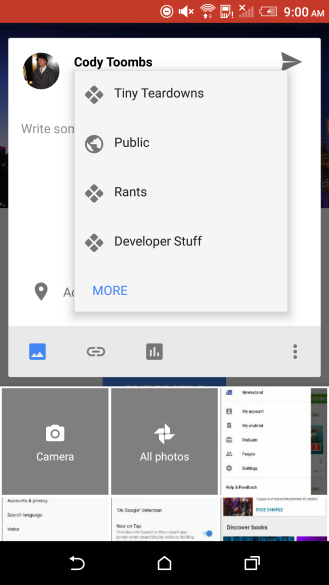 Your search bar in G+ now has search history and auto-complete as well. We've also noticed that the sharing selection dialog has switched from an older dropdown style to the new material full-width sheet (see above). 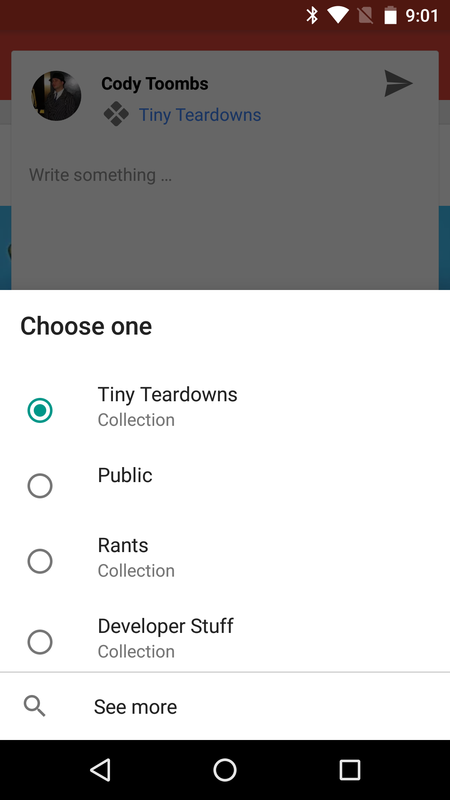 The update is rolling out in the Play Store, but we've got it on APK Mirror too.